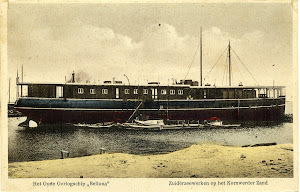 An item reported that the Komarno shipyards [Czechoslovakia , nowadays Slovakia] were building gunboats (so-called monitory) with as dimensions 70 x 9 metres for Soviet account. The armament consisted of Skoda mountain guns mounted in 4 gun turrets to which heavy machineguns were added. The 2-1.000hp naptha fuelled steam engines allowed an average downstream speed of 25 kilometres.